In a bid to make every other cop on the planet jealous, the Los Angeles Police Department will soon begin testing the viability of armored electric gauntlets in law enforcement. 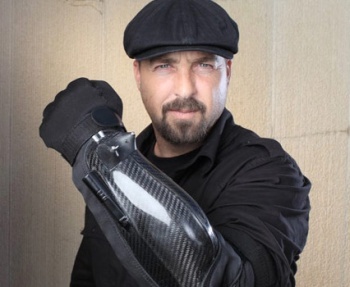 Created by inventor David Brown, the BodyGuard 9XI-HD01 is part taser, part arm guard, part mobile crime lab. It comes standard with an LED flashlight and video camera, but includes room to add GPS and chemical sensors as well. That's all well and good. Procedure is useful in a courtroom, but none of that is even remotely as awesome as the BodyGuard's self-defense capabilities. By pulling a grenade-style pin and tapping a button in the middle of your palm, the device arcs a bright blue burst of a half-million volts between two spikes situated on the back of the wearer's hand. Ideally this would be enough to cause criminals to surrender. If not, there's always the option to punch lightning into someone's chest. Despite its possible future usage in law enforcement and prison population control situations, the device has more altruistic origins. Brown, a professional cameraman, and friends were discussing an incident in which a mountain lion attacked a group of cyclists, killing one and maiming another. In such a situation, Brown believes, fear and anxiety would cause most people to drop or misuse any possible weaponry they might have. The BodyGuard, by contrast, is a device designed to be used "instinctively." Seven years and 30 prototypes later, Brown has a version of his invention that offers protection and prevents users from shocking themselves. The BodyGuard has earned a spot as one of Popular Science's 2011 Inventions of the Year, and the site has a video of the device in action which stars Kevin "Ironically, star of The Bodyguard" Costner. It turns out that he's an investor, but I still would have preferred Christopher Lambert as the celebrity cameo.